Supervisor Michael Devries sent me a copy of the lawsuit filed by Hocul Advertising against Grand Rapids Township, which asks that the Township’s ordinance banning electronic billboards (and off-site advertising in general) be ruled unconstitutional. It makes interesting reading. This is an issue currently being litigated around the country. Several states and many cities have banned them, or are considering a ban. 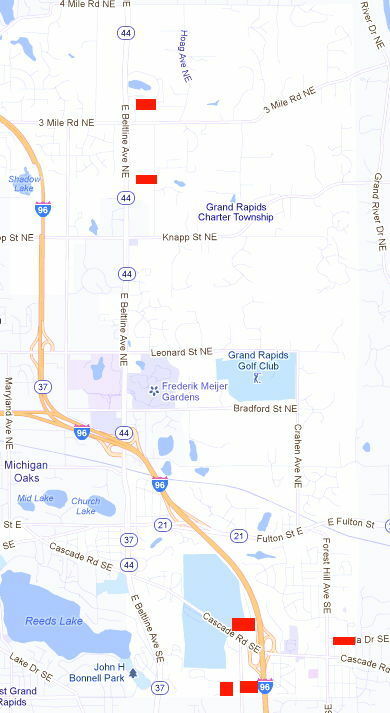 The usual result, as in Grand Rapids Township, is a lawsuit. A by-now somewhat outdated article in USA Today from 2010 is an introduction to the issues. A good recent report comes from the G.R. Law firm Mika, Meyers, Beckett and Jones. These billboards can range from $200,000 to $500,000 to erect, far more than traditional billboards. However, they have all sorts of advantages to advertisers. The content can be managed remotely. I had a student a few years back who worked for a billboard company. He could change the content from his dorm room. Differential rates can be charged, higher during prime commuting hours, lower at 3 a.m. This allows companies to get far more revenue from the same space than is possible with traditional billboards — and advertisers like them because they can pay less for part-time advertising on digital billboards than for having exclusive placement on a traditional one. However, these billboards are obtrusive (which, of course, is exactly why billboard companies want to erect them). Day or night (and especially at night), they are hard to ignore. Their light pollution blots out the night sky. They distract drivers, particularly when not along expressways (two of the proposed billboards are along the Beltline, one on East Paris). They consume a great deal of energy. For a report on some of the unfortunate effects of electronic billboards, see a report titled Illuminating the Issues. 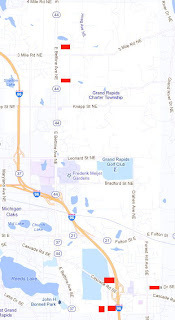 Hocul Advertising LLC is suing Grand Rapids Township because it will not grant permission to erect electronic billboards. Under township ordinance off-site signs are not allowed. Hocul Advertising had earlier filed suit in federal court, which ruled it did not have jurisdiction, so it has now filed suit in Kent County Circuit Court. The company wants to erect six signs. The addresses given in Jan Holst’s Cadence article are 4609 Cascade Rd., 660 Cascade West Parkway, 2300 and 2808 East Beltline NE, and 1000 and 1002 East Paris. The East Paris billboards are close together, one facing I-96, the other East Paris. Clicking on the map will pull up a larger version. The court will have to determine the legality of the ban, but I hope it supports the township. There are enough such billboards already. They are obtrusive, which is exactly why Hocul wants them. Day or night they blot the landscape. Back in 2000, Grand Rapids Township published a history of the township. A few copies are left, and the township office will sell one of them to you for $15. I recommend it. It is not a great work of history — it is of the this happened, then that happened, school of history. But it has a lot of information that will be of interest to those who live here. Did you know, for example, that Grand Rapids Township is one of the oldest units of government in the State of Michigan? It was founded in 1834, four years before the village of Grand Rapids. Michigan became a state only in 1837. 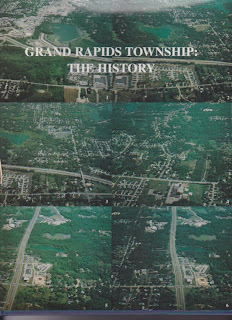 The township originally extended to the Grand River, but a series of annexations by the city kept reducing its size. I’ll be posting tidbits from the book as time goes on — but I recommend stopping by the township hall to buy a copy. The township has a 205 acre piece of land between Leonard and Knapp Court that it hopes to develop as a park. There is an information session at the township office today until 7:00 p.m., but all the information is available on the township web site and public comments can be made for at least another week. This is a fine piece of property convenient to many residents — I recommend looking the material over and giving an opinion. The township does a good job with its parks. If you’ve not visited the existing park behind the township hall, take a look when convenient. Whenever I’ve been by it is well used. Today is the deadline for filing for candidacy for the August 7 primary. Besides the four existing trustees who want to continue in office, there are two challengers: I am one of them. The other is Lindsey Koorndyk. I don’t know much about Ms. Koorndyk. She is 24 years old, a recent graduate of Michigan State, and engaged to be married four days after the election. She comes from a political family; her father Dan Koorndyk is a Kent County Commissioner. 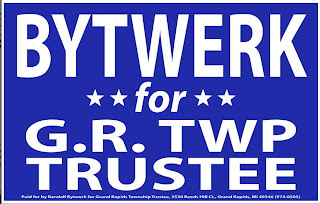 I do think running for township office is a great idea for someone like her, perhaps interested in a political career. Running for the township board is relatively easy (it takes only 20 signatures to get on the ballot). It can easily lead to other offices. Current county commissioner Jim Saalfeld started out on the G.R. Township Board, for example. I think former Congressman Vern Ehlers began as a county commissioner. I’ll want to see what Ms. Koorndyk proposes to do if elected, but I will be inclined to support her if she has good ideas. 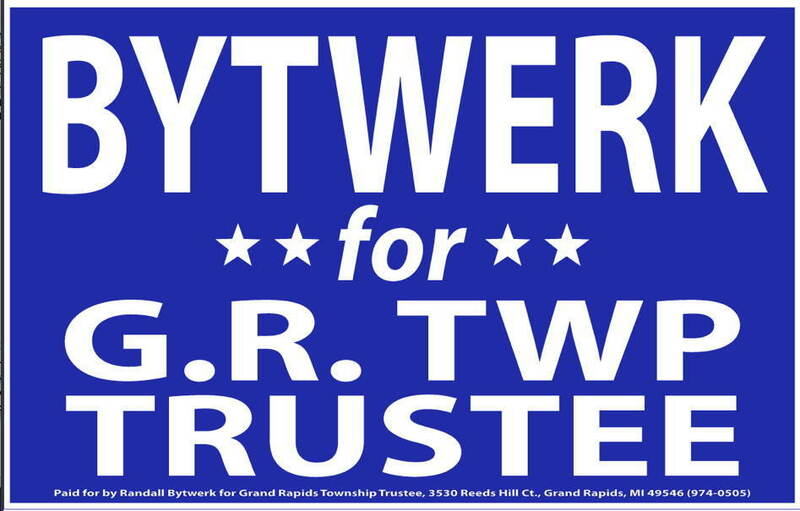 If you live in Grand Rapids Township and are willing to support my campaign by putting a yard sign up in the weeks before the August 7 primary please let me know. I will be delighted to deliver a sign when the time comes.